In mammals, GAD exists in two isoforms with molecular weights of 67 and 65 kDa (GAD67 and GAD65), which are encoded by two different genes on different chromosomes (GAD1 and GAD2 genes, chromosomes 4 and 10 respectively). GAD67 and GAD65 are expressed in the brain where GABA is used as a neurotransmitter, and they are also expressed in the insulin-producing β-cells of the pancreas, in varying ratios depending upon the species. Together, these two enzymes maintain the only physiological supply of GABA in mammals. Several truncated transcripts and polypeptides of GAD67 are detectable in the developing brain, however their function, if any, is unknown. Despite an extensive sequence similarity between the two genes, GAD65 and GAD67 fulfill very different roles within the human body. Additionally, research suggests that GAD65 and GAD67 are regulated by distinctly different cellular mechanisms. GAD65 and GAD67 synthesize GABA at different locations in the cell, at different developmental times, and for functionally different purposes. GAD67 is spread evenly throughout the cell while GAD65 is localized to nerve terminals. GAD67 synthesizes GABA for neuron activity unrelated to neurotransmission, such as synaptogenesis and protection from neural injury. This function requires widespread, ubiquitous presence of GABA. GAD65, however, synthesizes GABA for neurotransmission, and therefore is only necessary at nerve terminals and synapses. In order to aid in neurotransmission, GAD65 forms a complex with Heat Shock Cognate 70 (HSC70), cysteine string protein (CSP) and Vesicular GABA transporter VGAT, which, as a complex, helps package GABA into vesicles for release during neurotransmission. GAD67 is transcribed during early development, while GAD65 is not transcribed until later in life. This developmental difference in GAD67 and GAD65 reflects the functional properties of each isoform; GAD67 is needed throughout development for normal cellular functioning, while GAD65 is not needed until slightly later in development when synaptic inhibition is more prevalent. 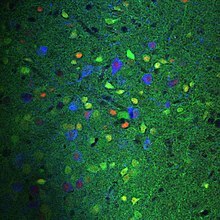 Gad65 in red, Gad67 in green, and Tyrosine Hydroxylase (blue) in the Ventral Tegmental Area of the mouse brain. GAD67 and GAD65 are also regulated differently post-translationally. Both GAD65 and GAD67 are regulated via phosphorylation of a dynamic catalytic loop, but the regulation of these isoforms differs; GAD65 is activated by phosphorylation while GAD67 is inhibited by phosphorylation. GAD67 is predominantly found activated (~92%), whereas GAD65 is predominantly found inactivated (~72%). GAD67 is phosphorylated at threonine 91 by protein kinase A (PKA), while GAD65 is phosphorylated, and therefore regulated by, protein kinase C (PKC). Both GAD67 and GAD65 are also regulated post-translationally by Pyridoxal 5’-phosphate (PLP); GAD is activated when bound to PLP and inactive when not bound to PLP. Majority of GAD67 is bound to PLP at any given time, whereas GAD65 binds PLP when GABA is needed for neurotransmission. This reflects the functional properties of the two isoforms; GAD67 must be active at all times for normal cellular functioning, and is therefore constantly activated by PLP, while GAD65 must only be activated when GABA neurotransmission occurs, and is therefore regulated according to the synaptic environment. Studies with mice also show functional differences between Gad67 and Gad65. GAD67−/− mice are born with cleft palate and die within a day after birth while GAD65−/− mice survive with a slightly increased tendency in seizures. Additionally, GAD65+/- have symptoms defined similarly to ADHD in humans. Both GAD67 and GAD65 are present in all types of synapses within the human nervous system. This includes dendrodendritic, axosomatic, and axodendritic synapses. Preliminary evidence suggests that GAD65 is dominant in the visual and neuroendocrine systems, which undergo more phasic changes. It is also believed that GAD67 is present at higher amounts in tonically active neurons. Both GAD65 and GAD67 experience significant downregulation in cases of autism. In a comparison of autistic versus control brains, GAD65 and GAD67 experienced a downregulation average of 50% in parietal and cerebellar cortices of autistic brains. Cerebellar purjinke cells also reported a 40% downregulation, suggesting that affected cerebellar nuclei may disrupt output to higher order motor and cognitive areas of the brain. Both GAD67 and GAD65 are targets of autoantibodies in people who later develop type 1 diabetes mellitus or latent autoimmune diabetes. Injections with GAD65 in ways that induce immune tolerance have been shown to prevent type 1 diabetes in rodent models. In clinical trials, injections with GAD65 have been shown to preserve some insulin production for 30 months in humans with type 1 diabetes. High titers of autoantibodies to glutamic acid decarboxylase (GAD) are well documented in association with stiff person syndrome (SPS). Glutamic acid decarboxylase is the rate-limiting enzyme in the synthesis of γ-aminobutyric acid (GABA), and impaired function of GABAergic neurons has been implicated in the pathogenesis of SPS. Autoantibodies to GAD might be the causative agent or a disease marker. Substantial dysregulation of GAD mRNA expression, coupled with downregulation of reelin, is observed in schizophrenia and bipolar disorder. The most pronounced downregulation of GAD67 was found in hippocampal stratum oriens layer in both disorders and in other layers and structures of hippocampus with varying degrees. GAD67 is a key enzyme involved in the synthesis of inhibitory neurotransmitter GABA and people with schizophrenia have been shown to express lower amounts of GAD67 in the dorsolateral prefrontal cortex compared to healthy controls. The mechanism underlying the decreased levels of GAD67 in people with schizophrenia remains unclear. Some have proposed that an immediate early gene, Zif268, which normally binds to the promoter region of GAD67 and increases transcription of GAD67, is lower in schizophrenic patients, thus contributing to decreased levels of GAD67. Since the dorsolateral prefrontal cortex (DLPFC) is involved in working memory, and GAD67 and Zif268 mRNA levels are lower in the DLPFC of schizophrenic patients, this molecular alteration may account, at least in part, for the working memory impairments associated with the disease. The bilateral delivery of glutamic acid decarboxylase (GAD) by an adeno-associated viral vector into the subthalamic nucleus of patients between 30 and 75 years of age with advanced, progressive, levodopa-responsive Parkinson disease resulted in significant improvement over baseline during the course of a six-month study. Intracerebellar administration of GAD autoantibodies to animals increases the excitability of motoneurons and impairs the production of nitric oxide (NO), a molecule involved in learning. Epitope recognition contributes to cerebellar involvement. Reduced GABA levels increase glutamate levels as a consequence of lower inhibition of subtypes of GABA receptors. Higher glutamate levels activate microglia and activation of xc(−) increases the extracellular glutamate release. Peripheral nerve injury of the sciatic nerve (a neuropathic pain model) induces a transient loss of GAD65 immunoreactive terminals in the spinal cord dorsal horn and suggests a potential involvement for these alterations in the development and amelioration of pain behaviour. Antibodies directed against glutamic acid decarboxylase (GAD) are increasingly found in patients with other symptoms indicative of central nervous system (CNS) dysfunction, such as ataxia, progressive encephalomyelitis with rigidity and myoclonus (PERM), limbic encephalitis, and epilepsy. The pattern of anti-GAD antibodies in epilepsy differs from type 1 diabetes and stiff-person syndrome. It is also believed that the control of glutamate decarboxylase has the prospect of improving citrus produce quality post-harvest. In Citrus plants, research has shown that glutamate decarboxylase plays a key role in citrate metabolism. With the increase of glutamate decarboxylase via direct exposure, citrate levels have been seen to significantly increase within plants, and in conjunction post-harvest quality maintenance was significantly improved, and rot rates decreased. ^ Erlander MG, Tillakaratne NJ, Feldblum S, Patel N, Tobin AJ (July 1991). "Two genes encode distinct glutamate decarboxylases". Neuron. 7 (1): 91–100. doi:10.1016/0896-6273(91)90077-D. PMID 2069816. ^ a b Langendorf CG, Tuck KL, Key TL, Fenalti G, Pike RN, Rosado CJ, et al. (January 2013). "Structural characterization of the mechanism through which human glutamic acid decarboxylase auto-activates". Bioscience Reports. 33 (1): 137–44. doi:10.1042/BSR20120111. PMC 3546353. PMID 23126365. ^ Kim J, Richter W, Aanstoot HJ, Shi Y, Fu Q, Rajotte R, et al. (December 1993). "Differential expression of GAD65 and GAD67 in human, rat, and mouse pancreatic islets". Diabetes. 42 (12): 1799–808. doi:10.2337/diab.42.12.1799. PMID 8243826. ^ Szabo G, Katarova Z, Greenspan R (November 1994). "Distinct protein forms are produced from alternatively spliced bicistronic glutamic acid decarboxylase mRNAs during development". Molecular and Cellular Biology. 14 (11): 7535–45. doi:10.1128/mcb.14.11.7535. PMC 359290. PMID 7935469. ^ a b c d e f Pinal CS, Tobin AJ (1998). "Uniqueness and redundancy in GABA production". Perspectives on Developmental Neurobiology. 5 (2–3): 109–18. PMID 9777629. ^ a b c Soghomonian JJ, Martin DL (December 1998). "Two isoforms of glutamate decarboxylase: why?". Trends in Pharmacological Sciences. 19 (12): 500–5. doi:10.1016/s0165-6147(98)01270-x. PMID 9871412. ^ Kaufman DL, Houser CR, Tobin AJ (February 1991). "Two forms of the gamma-aminobutyric acid synthetic enzyme glutamate decarboxylase have distinct intraneuronal distributions and cofactor interactions". Journal of Neurochemistry. 56 (2): 720–3. doi:10.1111/j.1471-4159.1991.tb08211.x. PMID 1988566. ^ Kanaani J, Cianciaruso C, Phelps EA, Pasquier M, Brioudes E, Billestrup N, Baekkeskov S (2015). "Compartmentalization of GABA synthesis by GAD67 differs between pancreatic beta cells and neurons". PLOS One. 10 (2): e0117130. doi:10.1371/journal.pone.0117130. PMC 4315522. PMID 25647668. ^ Jin H, Wu H, Osterhaus G, Wei J, Davis K, Sha D, et al. (April 2003). "Demonstration of functional coupling between gamma -aminobutyric acid (GABA) synthesis and vesicular GABA transport into synaptic vesicles". Proceedings of the National Academy of Sciences of the United States of America. 100 (7): 4293–8. doi:10.1073/pnas.0730698100. PMC 153086. PMID 12634427. ^ Wei J, Davis KM, Wu H, Wu JY (May 2004). "Protein phosphorylation of human brain glutamic acid decarboxylase (GAD)65 and GAD67 and its physiological implications". Biochemistry. 43 (20): 6182–9. doi:10.1021/bi0496992. PMID 15147202. ^ Fenalti G, Law RH, Buckle AM, Langendorf C, Tuck K, Rosado CJ, et al. (April 2007). "GABA production by glutamic acid decarboxylase is regulated by a dynamic catalytic loop". Nature Structural & Molecular Biology. 14 (4): 280–6. doi:10.1038/nsmb1228. PMID 17384644. ^ a b c Battaglioli G, Liu H, Martin DL (August 2003). "Kinetic differences between the isoforms of glutamate decarboxylase: implications for the regulation of GABA synthesis". Journal of Neurochemistry. 86 (4): 879–87. doi:10.1046/j.1471-4159.2003.01910.x. PMID 12887686. ^ Ueno H (October 2000). "Enzymatic and structural aspects on glutamate decarboxylase". Journal of Molecular Catalysis B: Enzymatic. 10 (1–3): 67–79. doi:10.1016/S1381-1177(00)00114-4. ^ Feldblum S, Erlander MG, Tobin AJ (April 1993). "Different distributions of GAD65 and GAD67 mRNAs suggest that the two glutamate decarboxylases play distinctive functional roles". Journal of Neuroscience Research. 34 (6): 689–706. doi:10.1002/jnr.490340612. PMID 8315667. ^ Fatemi SH, Halt AR, Stary JM, Kanodia R, Schulz SC, Realmuto GR (October 2002). "Glutamic acid decarboxylase 65 and 67 kDa proteins are reduced in autistic parietal and cerebellar cortices". Biological Psychiatry. 52 (8): 805–10. doi:10.1016/S0006-3223(02)01430-0. PMID 12372652. ^ Baekkeskov S, Aanstoot HJ, Christgau S, Reetz A, Solimena M, Cascalho M, Folli F, Richter-Olesen H, De Camilli P, Camilli PD (September 1990). "Identification of the 64K autoantigen in insulin-dependent diabetes as the GABA-synthesizing enzyme glutamic acid decarboxylase". Nature. 347 (6289): 151–6. doi:10.1038/347151a0. PMID 1697648. ^ Kaufman DL, Erlander MG, Clare-Salzler M, Atkinson MA, Maclaren NK, Tobin AJ (January 1992). "Autoimmunity to two forms of glutamate decarboxylase in insulin-dependent diabetes mellitus". The Journal of Clinical Investigation. 89 (1): 283–92. doi:10.1172/JCI115573. PMC 442846. PMID 1370298. ^ Tisch R, Yang XD, Singer SM, Liblau RS, Fugger L, McDevitt HO (November 1993). "Immune response to glutamic acid decarboxylase correlates with insulitis in non-obese diabetic mice". Nature. 366 (6450): 72–5. doi:10.1038/366072a0. PMID 8232539. ^ Kaufman DL, Clare-Salzler M, Tian J, Forsthuber T, Ting GS, Robinson P, Atkinson MA, Sercarz EE, Tobin AJ, Lehmann PV (November 1993). "Spontaneous loss of T-cell tolerance to glutamic acid decarboxylase in murine insulin-dependent diabetes". Nature. 366 (6450): 69–72. doi:10.1038/366069a0. PMID 7694152. ^ Tian J, Clare-Salzler M, Herschenfeld A, Middleton B, Newman D, Mueller R, Arita S, Evans C, Atkinson MA, Mullen Y, Sarvetnick N, Tobin AJ, Lehmann PV, Kaufman DL (December 1996). "Modulating autoimmune responses to GAD inhibits disease progression and prolongs islet graft survival in diabetes-prone mice". Nature Medicine. 2 (12): 1348–53. doi:10.1038/nm1296-1348. PMID 8946834. ^ Ludvigsson J, Faresjö M, Hjorth M, Axelsson S, Chéramy M, Pihl M, Vaarala O, Forsander G, Ivarsson S, Johansson C, Lindh A, Nilsson NO, Aman J, Ortqvist E, Zerhouni P, Casas R (October 2008). "GAD treatment and insulin secretion in recent-onset type 1 diabetes". The New England Journal of Medicine. 359 (18): 1909–20. doi:10.1056/NEJMoa0804328. PMID 18843118. ^ "Diamyd announces completion of type 1 diabetes vaccine trial with long term efficacy demonstrated at 30 months". Press Release. Diamyd Medical AB. 2008-01-28. Retrieved 2010-01-13. ^ Dalakas MC, Fujii M, Li M, Lutfi B, Kyhos J, McElroy B (December 2001). "High-dose intravenous immune globulin for stiff-person syndrome". The New England Journal of Medicine. 345 (26): 1870–6. doi:10.1056/NEJMoa01167. PMID 11756577. ^ Chang T, Alexopoulos H, McMenamin M, Carvajal-González A, Alexander SK, Deacon R, Erdelyi F, Szabó G, Gabor S, Lang B, Blaes F, Brown P, Vincent A (September 2013). "Neuronal surface and glutamic acid decarboxylase autoantibodies in Nonparaneoplastic stiff person syndrome". JAMA Neurology. 70 (9): 1140–9. doi:10.1001/jamaneurol.2013.3499. PMID 23877118. ^ Woo TU, Walsh JP, Benes FM (July 2004). "Density of glutamic acid decarboxylase 67 messenger RNA-containing neurons that express the N-methyl-D-aspartate receptor subunit NR2A in the anterior cingulate cortex in schizophrenia and bipolar disorder". Archives of General Psychiatry. 61 (7): 649–57. doi:10.1001/archpsyc.61.7.649. PMID 15237077. ^ Benes FM, Lim B, Matzilevich D, Walsh JP, Subburaju S, Minns M (June 2007). "Regulation of the GABA cell phenotype in hippocampus of schizophrenics and bipolars". Proceedings of the National Academy of Sciences of the United States of America. 104 (24): 10164–9. doi:10.1073/pnas.0703806104. PMC 1888575. PMID 17553960. ^ a b Kimoto S, Bazmi HH, Lewis DA (September 2014). "Lower expression of glutamic acid decarboxylase 67 in the prefrontal cortex in schizophrenia: contribution of altered regulation by Zif268". The American Journal of Psychiatry. 171 (9): 969–78. doi:10.1176/appi.ajp.2014.14010004. PMC 4376371. PMID 24874453. ^ LeWitt PA, Rezai AR, Leehey MA, Ojemann SG, Flaherty AW, Eskandar EN, Kostyk SK, Thomas K, Sarkar A, Siddiqui MS, Tatter SB, Schwalb JM, Poston KL, Henderson JM, Kurlan RM, Richard IH, Van Meter L, Sapan CV, During MJ, Kaplitt MG, Feigin A (April 2011). "AAV2-GAD gene therapy for advanced Parkinson's disease: a double-blind, sham-surgery controlled, randomised trial". The Lancet. Neurology. 10 (4): 309–19. doi:10.1016/S1474-4422(11)70039-4. PMID 21419704. ^ Manto MU, Hampe CS, Rogemond V, Honnorat J (February 2011). "Respective implications of glutamate decarboxylase antibodies in stiff person syndrome and cerebellar ataxia". Orphanet Journal of Rare Diseases. 6 (3): 3. doi:10.1186/1750-1172-6-3. PMC 3042903. PMID 21294897. ^ Mitoma H, Manto M, Hampe CS (2017-03-12). "Pathogenic Roles of Glutamic Acid Decarboxylase 65 Autoantibodies in Cerebellar Ataxias". Journal of Immunology Research. 2017: 2913297. doi:10.1155/2017/2913297. PMC 5366212. PMID 28386570. ^ Lorenzo LE, Magnussen C, Bailey AL, St Louis M, De Koninck Y, Ribeiro-da-Silva A (September 2014). "Spatial and temporal pattern of changes in the number of GAD65-immunoreactive inhibitory terminals in the rat superficial dorsal horn following peripheral nerve injury". Molecular Pain. 10 (1): 57. doi:10.1186/1744-8069-10-57. PMC 4164746. PMID 25189404. ^ Dayalu P, Teener JW (November 2012). "Stiff Person syndrome and other anti-GAD-associated neurologic disorders". Seminars in Neurology. 32 (5): 544–9. doi:10.1055/s-0033-1334477. PMID 23677666. ^ Liimatainen S, Honnorat J, Pittock SJ, McKeon A, Manto M, Radtke JR, Hampe CS (April 2018). "GAD65 autoantibody characteristics in patients with co-occurring type 1 diabetes and epilepsy may help identify underlying epilepsy etiologies". Orphanet Journal of Rare Diseases. 13 (1): 55. doi:10.1186/s13023-018-0787-5. PMC 5892043. PMID 29636076. ^ Sheng L, Shen D, Luo Y, Sun X, Wang J, Luo T, Zeng Y, Xu J, Deng X, Cheng Y (February 2017). "Exogenous γ-aminobutyric acid treatment affects citrate and amino acid accumulation to improve fruit quality and storage performance of postharvest citrus fruit". Food Chemistry. 216: 138–45. doi:10.1016/j.foodchem.2016.08.024. PMID 27596402. Genetics, Expression Profiling Support GABA Deficits in Schizophrenia - Schizophrenia Research Forum, 25 June 2007. This page was last edited on 1 April 2019, at 11:12 (UTC).